The first few years of a child’s life are the most important for growth and development. In recognition of how crucial these early years are to later learning, the early childhood curriculum at Beth Meyer Preschool integrates the best of early childhood theories and ideas. 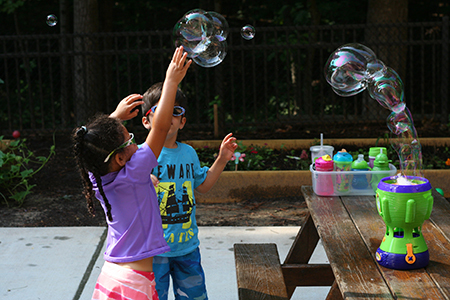 Our preschool is based on the Bank Street College of Education, which is approved by the North Carolina Division of Child Development and Early Education. Bank Street Curriculum is based on a theory that was developed back in the early 1900’s by a group of scholars. They believed that a child’s development unfolds at different times and ages for different children. One child may have better hand- eye coordination than another at the same age. Two children of the same age can differ in their interactions with others, one perhaps more social and outgoing. This approach emphasizes “meeting children on their own terms”. To do this, teachers must have deep knowledge of child development and be highly skilled at observing children in their daily lives. Our lesson plans are carefully thought out each week in order to touch on all four areas of growth, physical-motor, language, social-emotional and intellectual-cognitive. Each area of growth is affected by and influences every area of development.